Vemurafenib (PLX4032, RG7204) is a novel and potent inhibitor of B-RafV600E with IC50 of 31 nM in cell-free assay. 10-fold selective for B-RafV600E over wild-type B-Raf in enzymatic assays and the cellular selectivity can exceed 100-fold. The regressing tumour microenvironment stimulates the outgrowth, infiltration and metastasis of drug-resistant clones. b, Bioluminescent signal of drug-resistant A375RTGL cells in vemurafenib-sensitive, A375 tumours, treated with vehicle or vemurafenib for 5 days (vehicle, n = 36; vemurafenib, n = 15 tumours). D, day. c, EdU incorporation in A375R-TGL cells in A375/A375R-TGL tumours treated with vehicle or vemurafenib for 4 days, as determined by FACS (vehicle, n = 8; vemurafenib, n = 6 tumours). d, Bioluminescent signal of A375R-TGL tumours alone, treated with vehicle or vemurafenib for 5 days (vehicle, n 5 38; vemurafenib, n = 15 tumours). e, Bioluminescent signal of TGLexpressing drug-resistant cancer cells (A375R, M249R4, PC9 and H2030) in drug-sensitive tumours (Colo800, LOX, UACC62, M249, H3122 and HCC827) treated with vehicle or drugs (vemurafenib, crizotinib and erlotinib) for 5 days (n (from left to right on the graph) = 6, 7, 12, 12, 9, 9, 25, 26, 9, 12, 12, 12, 16 and 11 tumours). f, Spontaneous lung metastasis by A375R cells in mice bearing A375/A375R-TGL tumours treated with vehicle or vemurafenib (10 days), visualized by BLI (n = 4). Sorafenib Tosylate is a multikinase inhibitor of Raf-1, B-Raf and VEGFR-2 with IC50 of 6 nM, 22 nM and 90 nM in cell-free assays, respectively. Western blot analysis of proteins expression levels in pericytes at 5-hour treatment with DMSO (vehicle), 10 μmol/L vemurafenib (Vemu. ), 2.5 μmol/L sorafenib (Sora. ), and combined therapy with 10 μmol/L vemurafenib plus 2.5 μmol/L sorafenib. These results were validated by three independent replicate measurements. Cells were grown in 0.2% FBS DMEM growth medium during treatment. PLX4720 is a potent and selective inhibitor of B-RafV600E with IC50 of 13 nM in a cell-free assay, equally potent to c-Raf-1(Y340D and Y341D mutations), 10-fold selectivity for B-RafV600E than wild-type B-Raf. Combinatorial knockdown of NF1 and C-RAF abrogates NF1-mediated resistance to B-RAF inhibition at the level of ERK phosphorylation. A375 cells were infected with NF1 shRNA and treated with either DMSO or PLX4720 for 16 h. Cell lysates were analyzed for the indicated proteins. Dabrafenib (GSK2118436) is a mutant BRAFV600 specific inhibitor with IC50 of 0.7 nM in cell-free assays, with 7- and 9-fold less potency against B-Raf(wt) and c-Raf, respectively. BRAFi/MEKi-resistant A375DR and the parental A375 cells were treated with 2 μM vorinostat and/or the combination of 0.125 μM dabrafenib and 5 nM trametinib. Protein lysates were harvested after 72 hr. Western blot analysis was carried out for p-MEK and p-P90RSK as indicators of activation of MAPK pathway, ac-H3 as indicator for levels of acetylated histone H3 and a-tubulin as a loading control. GDC-0879 is a novel, potent, and selective B-Raf inhibitor with IC50 of 0.13 nM in A375 and Colo205 cells with activity against c-Raf as well; no inhibition known to other protein kinases. Effect of RAF or multikinase inhibitors on RAF1-proficient and -deficient DIH. Immunoblot analysis of DIH treated with GDC-0879 (GDC), Sorafenib (SOR) or PP2. Proliferation was assessed after a 48 h treatment, and immunoblotting after 1 h treatment. TUBA, loading control. AZ304 is a synthetic inhibitor designed to interact with the ATP-binding site of wild type and V600E mutant BRAF with IC50 values of 79 nM and 38 nM, respectively. It also inhibits CRAF, p38 and CSF1R at sub 100 nM potencies. PLX8394 is a next-generation, orally available, small-molecule BRAF inhibitor with IC50 values of 3.8 nM, 14 nM and 23 nM for BRAF(V600E), WT BRAF and CRAF respectively. It has potential antineoplastic activity. LXH254 is a type II ATP-competitive inhibitor that inhibits both B- and CRAF kinase activities at picomolar concentrations with a high degree of selectivity against a panel of 456 human kinases and in cell-based assays. Dabrafenib Mesylate is the mesylate salt form of dabrafenib, an orally bioavailable inhibitor of B-raf (BRAF) protein with IC50s of 0.8 nM, 3.2 nM and 5 nM for B-Raf (V600E), B-Raf (WT) and C-Raf, respectively. Regorafenib is a novel oral multikinase inhibitor with IC50 values of 13, 4.2, 46, 22, 7, 1.5, 2.5, 28, 19 nM for VEGFR1, murine VEGFR2, murine VEGFR3, PDGFR-β, KIT, RET, RAF-1, B-RAF and B-RAF(V600E) respectively. RAF709 is a potent inhibitor of B/C RAF kinase with almost equivalent IC50 values of 0.4 nM for B-RAF and C-RAF, showing a high level of selectivity, demonstrating greater than 99% on-target binding to BRAF, BRAFV600E, and CRAF at 1 μM and very few off-targets with DDR1 (>99%), DDR2 (86%), FRK (92%), and PDGFRb (96%), the only kinases with binding >80% at 1 μM. RAF265 (CHIR-265) is a potent selective inhibitor of C-Raf/B-Raf/B-Raf V600E with IC50 of 3-60 nM, and exhibits potent inhibition on VEGFR2 phosphorylation with EC50 of 30 nM in cell-free assays. Phase 2. Raf265 inhibited the kinase activity of B-Raf but not of Raf-1 in Pkd2cKO cholangiocytes. Cells were treated for 30 min with different concentrations of Raf265. B-Raf and Raf-1 were immunoprecipated as described in the methods section and a kinase assay in vitro was performed using MEK as a substrate. The kinase activity of Raf was assessed by immunoblot analysis and quantified as optical density of pMEK with respect to untreated cells. In WT cholangiocytes (A) Raf265 inhibited both B-Raf and Raf-1 kinase activity. In Pkd2cKO cholangiocytes (B), Raf265 inhibited only B-Raf while a biphasic effect was found in Raf-1 with a significant increase at doses from 0.001 to 1 uM and a significant inhibition at 10 uM. Blots are representative of four different experiments. (*p<0.05 vs controls; **p<0.001 vs controls). AZ628 is a new pan-Raf inhibitor for BRAF, BRAFV600E, and c-Raf-1 with IC50 of 105 nM, 34 nM and 29 nM in cell-free assays, also inhibits VEGFR2, DDR2, Lyn, Flt1, FMS, etc. A375 cells were infected with the indicated shRNAs/ORFs. In parallel to the above, cells were also treated with 0.2 uM AZ628 for 16 h, cell lysates were analyzed by Western blotting for the indicated proteins. SB590885 is a potent B-Raf inhibitor with Ki of 0.16 nM in a cell-free assay, 11-fold greater selectivity for B-Raf over c-Raf, no inhibition to other human kinases. Western blotting of the indicated proteins in WM266-4 cells treated for 48 h with 1 μM of BRAF (PLX4032 or SB590885) or MEK (AZD6244 or AS703026) inhibitors. ZM 336372 is a potent and selective c-Raf inhibitor with IC50 of 70 nM, 10-fold selectivity over B-RAF, no inhibition to PKA/B/C, AMPK, p70S6, etc. Effect of inhibitors on EAP’s proliferation activity in NIH3T3 cell by MTT assay. Data are presented as mean ± SD of three independent experiments. **p50.01 versus EAP. Sorafenib is a multikinase inhibitor of Raf-1, B-Raf and VEGFR-2 with IC50 of 6 nM, 22 nM and 90 nM in cell-free assays, respectively. (A) and (C) qPCR showing the levels of HMGA2 and SOX9 mRNA in Hep3B and Huh7 human HCC cells treated for 48 hours with 1 μM AZD6244, or 7.5 μM sorafenib relative to control-treated cells (Ctrl). (B) and (D) qPCR showing Hmga2 and Sox9 expression in p53−/−; HRAS(G12V) and p53−/−; Myc; Cas9; sgNf1 mouse liver cells. Drug treatment was the same as in (A). Error bars are s.d. of mean (n = 3). ***, P < .001. Effect of select kinase inhibitors on DF508-CFTR maturation analyzed by immunoblotting. 293MSR-GT cells stably expressing DF508-CFTR were treated with 15 uM kinase inhibitors or 0.3% DMSO (vehicle control), as indicated, grown at 37 °C for 48 h, and the appearance of the mature protein, band C, monitored by immunoblotting with anti-CFTR antibodies. Band B represents the immature protein. DMSO represents vehicle-alone control, 27 °C represents temperature rescue of F508-CFTR at 27 °C, 37 °C represents untreated DF508-CFTR control, and WT represents WT-CFTR. Top panels depict the anti-CFTR immunoblot and bottom panels depict actin (loading) control. ** represents cellular toxicity. TAK-632 is a potent pan-Raf inhibitor with IC50 of 8.3 nM and 1.4 nM for B-Raf(wt) and C-Raf in cell-free assays, respectively, showing less or no inhibition against other tested kinases. 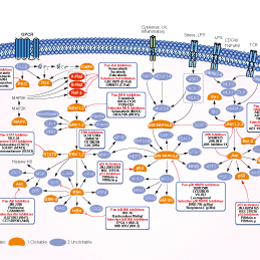 Graph showing a concentration-dependent response of hypoxia-induced HIF-1α-NanoLuc activity to RAS-RAF-MEK-ERK pathway inhibitors: GDC-0994, PD-184352, selumetinib, TAK632, trametinib, and vemurafenib. CEP-32496 is a highly potent inhibitor of BRAF(V600E/WT) and c-Raf with Kd of 14 nM/36 nM and 39 nM, also potent to Abl-1, c-Kit, Ret, PDGFRβ and VEGFR2, respectively; insignificant affinity for MEK-1, MEK-2, ERK-1 and ERK-2. Phase 1/2. Encorafenib (LGX818) is a highly potent RAF inhibitor with selective anti-proliferative and apoptotic activity in cells expressing B-RAF(V600E) with EC50 of 4 nM. Phase 3. Whole cell lysates from NRAS- or BRAF-mutant melanoma cells treated with encorafenib or/and binimetinib or DMSO as a control for 24 h were subjected to Western blot analysis to detect pERK, ERK and β-Actin. Experiment shown is a representative of three independent experiments. BAW2881 (NVP-BAW2881) is a novel vascular endothelial growth factor (VEGF) receptor tyrosine-kinase inhibitor that potently inhibits VEGFR1-3 at 1.0-4.3 nanomolar (nM) concentrations and inhibits PDGFRβ, c-Kit, and RET at 45-72 nM concentrations. CCT196969 is a novel orally available, pan-RAF inhibitor with anti-SRC activity. It also inhibits SRC, LCK, and the p38 MAPKs. Lifirafenib (BGB-283) potently inhibits RAF family kinases and EGFR activities in biochemical assays with IC50 values of 23, 29 and 495 nM for the recombinant BRAFV600E kinase domain, EGFR and EGFR T790M/L858R mutant. PLX7904, also known as PB04, is a potent and selective paradox-breaker RAF inhibitor. It is able to efficiently inhibit activation of ERK1/2 in mutant BRAF melanoma cells but does not hyperactivate ERK1/2 in mutant RAS-expressing cells. LY03009120 is a potent pan-Raf inhibitor with IC50 of 44 nM, 31-47 nM, and 42 nM for A-raf, B-Raf, and C-Raf in A375 cells, respectively. Phase 1. RO5126766 (CH5126766) is a dual RAF/MEK inhibitor with IC50 of 8.2 nM,19 nM, 56 nM, and 160 nM for BRAF V600E, BRAF, CRAF, and MEK1, respectively. Phase 1. MLN2480 is an oral, selective pan-Raf kinase inhibitor in chinical trials. Raf265 derivative, however, the effects of this derivative are not known.